Yes, one of the few RTs I have ever liked said this to me the other day. And I had to do a double take, my first thought complete confusion. Did I miss something? What does that mean? Was there some hidden meaning to it? That’s the problem with saying something like that to a guy. Or to me. I’m not bright enough to understand an ambiguous statement. Does it mean you’ll get in your car and drive to McDonalds for me, buy me two McGriddles, and hand feed them to me while I recline in the hospital bed? I’ve obsessed over the statement for two days now. And I’ve kicked myself for not simply asking, “What do you mean by that?” I’m sure it would have been innocent and harmless, as I look like . . . and smell like . . . five days of hospital grime and fevers. But I am a curious person with a vivid imagination set loose by ambiguities. But that wasn’t the strangest thing said to me this week. It doesn’t come close. Here’s my favorite. Awkward silence. Not sure she’ll be saying that to another patient now after I batted it around verbally for five minutes. Too bad. I ruined it for others. Or did I? Or are only my lungs pretty? I’d like to think so. That’s it. It’s been a rough two days of not feeling well. And that damn statement? 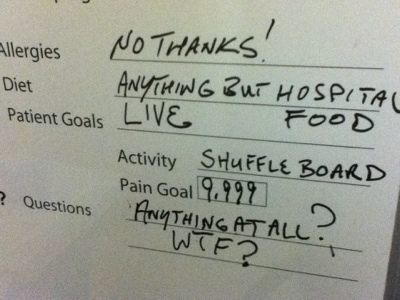 “Anything” with emphasis? What did that mean? Yes, I have problems. I know. 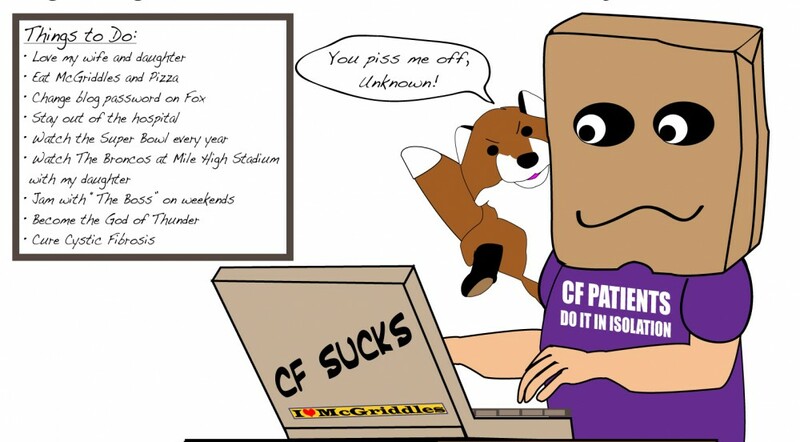 This entry was posted in cystic fibrosis, Fun & Humor, Health care, Human Nature by unknowncystic. Bookmark the permalink. I thought all hospitals in the US had McDonald’s on site? A 1litre bottle of vodka is on it’s way, get someone to plug it into your port for the best effect! Sorry you had to spend Independance Day in hospital but the fireworks show sounds impressive. Hopefully; you’ll be out of there soon, back home, and generating your own fireworks (ahem!). Take care and get back on your feet soon. Anxiously awaiting the update of the yellow Lab’s rehab from leg surgery. Hope it’s going doggedly good. Sorry for the delayed reply. I appreciate the comment and read it during my imprisonment. The yellow lab is doing better. She can go on walks now, but has to wait another month before she can be a normal dog again and play with the black lab. I’ve been so busy I haven’t had time to post anything about the dogs. 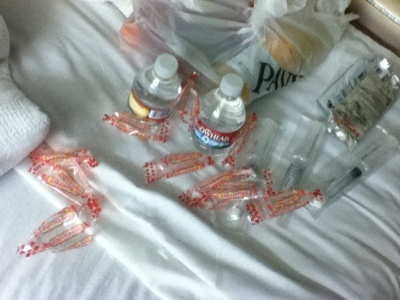 I once had a social worker tell me during a clinic visit that I had diabetes…. I had just seen the Dr’s and they said I was in good shape and my labs showed nothing of interest. The Social worker then argued with me for 10 min till she went to go ask the Doc what was going on. I had to later fire her as my social worker because she would stop by my room when I was in the hospital and spend a hour asking if I was being abused at home (I was 23 and living with my very supportive Dad and step mom) She was nuts, and is no longer at that CF clinic. I’ve had some problems with past social workers too. Sometimes, they can be a little odd. We have a good one at clinic now. She’s great, but I still kind of just keep stuff to myself. She doesn’t pry. Thanks for the tip on Luther. I will check it out. Sorry for the delayed reply. I blame the kitchen remodel.